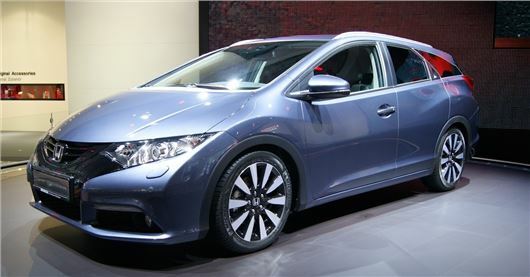 Honda has unveiled the new Civic Tourer at the Frankfurt Motor Show. Essentially an estate version of the Civic, the new tourer will boast a whopping 1668 litres of storage and be introduced to UK showrooms in early 2014. One of the big selling points of the Civic is its ‘Magic Seats’ system which, thanks to a repositioned fuel tank, lets you fold the seat bases up so you can carry tall objects like pot plants on the rear seat floor. You can also fold the seats down completely flat with the use of one lever and because the seat bases drop rather than fold up, the load length is maximised – handy for flat pack furniture. When everything is folded flat the load area is a capable 1668 litres, while it’s 624 litres with the seats in place – but that does include the easy-to-access underfloor area. Indeed the load area is tremendously versatile. There’s an underfloor compartment capable of swallowing up a pair of cabin-size cases, a hook for carrier bags, a 12v outlet and on upper trim levels a standard cargo net that can be fitted in two positions to keep objects – or dogs – from flying forward under heavy braking. Those who buy the lower spec model still get the mounting points for the net and so can buy it as an accessory. Another smart touch is an underfloor compartment for the tonneau cover – useful if you’re buying furniture and forget to leave it at home. What’s more - there’s increased space in the back than the regular hatch for passengers, thanks to a higher roof over the hatch. At launch, the Civic Tourer will be offered with the new 1.6 i-DTEC diesel engine, delivering 300Nm of torque and returning CO² emissions of just 99g/km. Buyers will also be able to specify Honda’s 1.8 i-VTEC engine in manual or automatic transmission producing 148g of CO2 per km. Upper model grades will have adaptive dampers – but only at the rear. This is an unusual step, given most manufacturers fit them to all four wheels, but it’ll reduce cost. The system constantly monitors the cars behaviour and changes the level of damping, keeping the car supple and comfortable unless it needs to cope with potholes, lumps and bumps or inputs from the driver, like heavy braking. It should make driving with heavy loads in the rear a bit safer and more stable.